FERC on Monday granted Ameren a rehearing on an incentive rate treatment for one portion of the company’s Grand Rivers transmission project while rejecting a simultaneous request for another segment. The 500-mile project, which is currently under development, will span Illinois and extend into Missouri, creating a continuous 345-kV path from Iowa to Indiana. In its Nov. 5 order, the commission dismissed Ameren’s contention that its February ruling failed to recognize its own precedent in Pepco Holdings, Inc., which distinguished between incentives requested after a project is already completed and those requested when a project is nearly complete (ER18-463). The commission said its February order made clear that projects being nearly completed does not necessarily preclude them from receiving incentive adders, but that such projects also face fewer challenges, a condition the commission found applied to Grand Rivers. “Pepco does not stand for the proposition that all incomplete projects will receive [a return on equity] incentive based on the risks and challenges of a project, as Ameren Transmission appears to suggest. Rather, Pepco stands for the proposition that an applicant may not seek incentives for a project that is already complete; a project that is not yet complete is eligible for incentives,” the commission wrote. The commission acknowledged that Pepco granted incentives to a project that was nearly complete, but that it no long believes that it is “appropriate” to provide incentives to such projects. “Thus, while a project being under construction does not preclude it from incentives, the commission will consider how close the project is to completion when evaluating the risks and challenges of the project — with less risk typically attendant to projects that are further along in the construction process. We note that consideration of construction progress as part of the nexus test is consistent with commission precedent,” FERC said. In this case, the commission found the Illinois Rivers component “failed to meet the nexus test,” given that it was 90% complete at the time of its December 2017 application for the adders, with four of its nine line segments already energized and all 10 of its substations in service. But in granting a rehearing for the Twain component of the project, FERC agreed with Ameren’s argument that it should be evaluated on its own merits — separately from Illinois Rivers — as the project had not yet broken ground by the time of last December’s application. 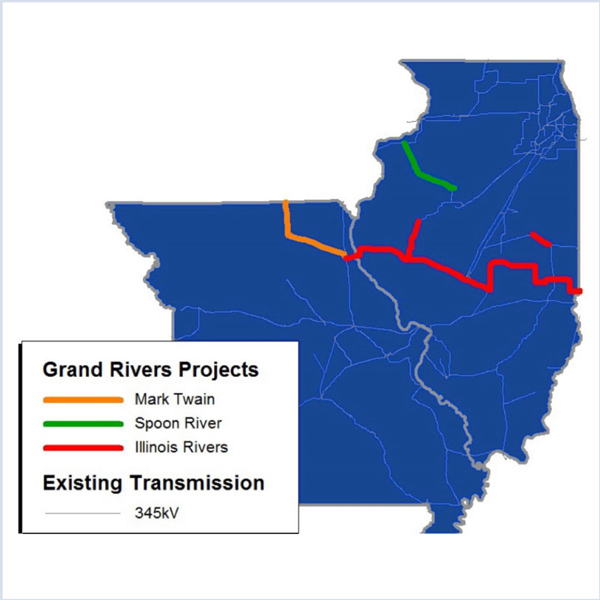 The commission also determined the Twain segment qualifies for the risk-reducing incentives spelled out in FERC’s 2012 policy statement on promoting transmission investment in that it will unlock constrained wind generation and relieve chronic and severe congestion, resulting in $2 billion in production cost savings across MISO. “We also note that the Mark Twain component was reviewed and approved as part of the MISO Transmission Expansion Plan 2011 portfolio of [multi-value projects], such that alternatives to the project have been considered in a relevant transmission planning process,” the commission noted. Monday’s order reduced Twain’s potential ROE adder to 50 basis points, citing FERC precedent in its 2015 NYISO ruling on the Edic-to-Pleasant Valley line and its 2018 ruling on NextEra Energy’s Empire line in New York, both of which are 345-kV projects similar to Twain. “We find that the Mark Twain component unlocks location-constrained generation and provides congestion relief in a range comparable to that of the projects awarded a 50-basis-point ROE incentive in NYISO and NextEra,” the commission said. FERC said it remains unconvinced that MISO’s plan to integrate qualifying facilities into Entergy’s footprint would violate Occidental Chemical’s rights under the Public Utility Regulatory Policies Act. FERC said it is streamlining its rehearing orders and creating a dedicated legal team within the Office of General Counsel to handle them. The Texas PUC agreed to wait until no later than June 10 before determining whether to grant a rehearing on its decision to allow Hunt Consolidated’s acquisition of Oncor.